STORRS - The UConn football program is nearing rock bottom. An 0-2 start to the season that has featured a pair of unthinkable, resounding blowouts has highlighted just how far the Huskies are from the being competitive on a national level. But how did things get so bad at UConn and who is to blame? In a blunt, sometimes dour press conference Tuesday at the Burton Family Football Complex that was ostensibly to discuss his team’s game Saturday against Rhode Island, UConn head coach Randy Edsall lamented the depths to which his program has sunk and even offered some blame - to those coaches and administrators at the helm after his first tenure with the team ended. Edsall left UConn immediately after guiding the Huskies to the 2011 Fiesta Bowl. He flew to College Park, Maryland, to take his “dream job” with the Terrapins the morning after his Huskies lost to Oklahoma. Despite his abrupt departure, Edsall apparently had hoped the program would be better taken care of in his absence. “Our program was here when I was here in 2010,” said Edsall, holding his hand up high above his head. “Just like Boise State’s. Twentieth-ranked Boise State just racked up an unheard of 818 yards last Saturday against the Huskies, pounding them 62-7. UConn has been outscored 118-24 in its first two games this season. 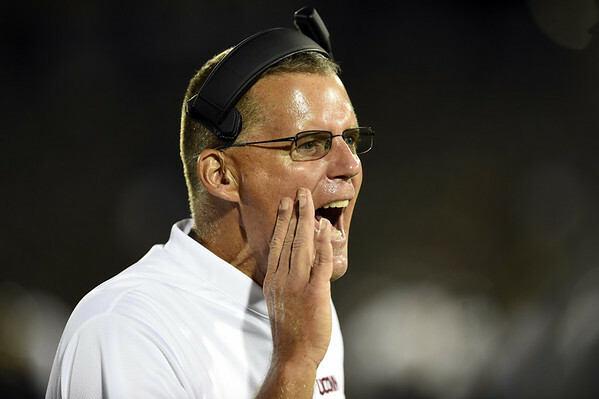 Edsall believes UConn might have been able to sustain some of the success his earlier Huskies had achieved had university officials made better head coaching hires following his departure. Paul Pasqualoni was hired as Edsall’s replacement in 2011. He coached the Huskies for two-and-a-half seasons before being fired. Bob Diaco was then hired to guide the Huskies for three more seasons. UConn has not had a winning record since Edsall’s departure, though Diaco’s 2015 Huskies were 6-6 in the regular season before losing to Marshall in the St. Petersburg Bowl. Edsall did not name Pasqualoni nor Diaco by name, nor did he call out former UConn athletic directors Jeff Hathaway or Warde Manuel. But he did say those in power during his time away from UConn “cut corners” and didn’t preserve what he had built. “It’s a great lesson that when you don’t do the right things, how quickly it can go,” Edsall said. The state of the program is such that UConn is unable to compete with the teams at the top level of its conference, the American Athletic, nor with others in the top-25 nationally. Now in his second season back with the Huskies, Edsall says it would be foolish to expect the Huskies to reach that level this year. Effort or not, the Huskies were unable to do very much on Saturday night in Boise, Idaho. “Boise State had a lot to do with why we didn’t execute. We were out-matched. We were overmatched,” Edsall said. Edsall understands fans want results. He says he wants them too. UConn is facing an FCS opponent this week in Rhode Island but it’s hardly expecting an easy victory. UConn is 15-1 against FCS teams since it left that division itself. Its only defeat in that span came to Towson when Pasqualoni was at the helm. “When I was here before we didn’t have an issue with FCS teams. And nothing against FCS teams,” Edsall said. After their second straight abysmal defensive performance, the Huskies made a number of changes to their depth chart for this week’s game against Rhode Island. Freshman Jeremy Lucien has been elevated and will start at cornerback in the spot that last week was manned by Ryan Carroll. Also, sophomore linebacker Eddie Hahn will start at weak-side linebacker in place of Darrian Beavers. Beavers, a sophomore who has shown some good pass-rushing skills in the past, has been moved to defensive end. “Not that I don’t think he can be a good linebacker, I just think he can be a better defensive end,” Edsall said. Hahn, Edsall said, will also be an asset for freshman linebacker Kevon Jones, helping with defensive play calls and alignments. Posted in Newington Town Crier, UConn on Wednesday, 12 September 2018 20:41. Updated: Wednesday, 12 September 2018 20:43.